Looking for a way to add some depth and movement to your tracks without spending a load of cash? Or do you want to incorporate some dubby effects without investing in a costly and temperamental tape delay device? Delay plug-ins could be the solution. These delay plug-ins deliver all the benefits of hardware delay units with the convenience of software. Best of all, they’re totally free! Delays are devices that add repeats or echoes to any sound that is routed through them. In the hardware realm, delays come in various types, from tape-equipped mechanisms to analog bucket brigade devices, to DSP units. In the software world, there are delay plugins that aim to replicate the sound and functionalities of classic hardware devices. There are also more fully-featured units that incorporate modulation, and various other features that go well beyond what typical delays have to offer. Even with the advent of DSP units and advanced-algorithm delay plug-ins, many musicians and producers continued to prefer hardware delays for their immediacy and warmer sound. But many current delay plug-ins now come close to replicating the warmth and idiosyncratic sounds of hardware devices. Even free plug-ins now compare favorably to the most revered hardware delay devices. 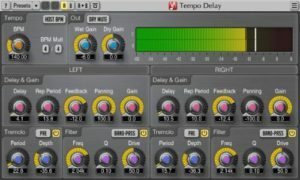 Voxengo’s Tempo Delay is a stereo delay plugin intended for a wide variety of production applications. As the name implies, it is a tempo-based delay that enables the setting of delay times in musical values according to the specified BPM. It also has a tremolo and a filter section. Like the delay values, these can be adjusted independently for the left and right channels. The Tempo Delay packs on a wealth of features that would be impressive even in a “for pay” plug-in. This could easily handle the majority of your delay needs. Lagrange by Ursa DSP is a stereo delay that ups the ante by incorporating elements of granular synthesis. 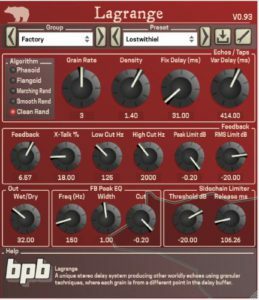 By capturing grains from different parts of the delay buffer, this plug-in can crank out some truly wild and wonderful sounds. Lagrange is fully capable of producing more typical delay effects of course. But a simple twist of the delay knob or the feedback control results in everything from resonant, metallic clangs to evolving alien soundscapes. Even if you already have a delay plug-in that you’re happy with, the Lagrange is a worthy addition to your arsenal. Valhalla’s Freq Echo is another delay plug-in that can handle more vanilla echoes and repeats like a champ. But where it really shines is in its ability to spit out anything from swirling flanging and phasing to some of the most psychedelic textures you have ever heard. Despite its simple and utilitarian interface, Freq Echo is capable of an exciting assortment of sounds. It even does a great job at cranking out warm and enigmatic dub echoes! Kjaerhus Audio Classic Delay is a bit more of a “typical” delay plug-in than the ones mentioned thus far, but it is certainly no less capable. Three modes are provided–Tape, Analog, and Digital–and each does a great job of approximating their associated modes without introducing any additional noise. There is a “quality” control that allows you to introduce varying amounts of “imperfection”, adding to the realism of the sound. Although the Audio Classic Delay doesn’t quite get into the freaky territory as readily as other more esoteric delay plug-ins, it can do some fairly outrageous effects care of the reversible feedback. A good, solid delay that should make a nice companion to your other quirkier plug-ins. The WatKat is a clone of the Wem Watkins “Custom” Copicat that is billed as a “Tribute to Charlie Watkins”. Like the original hardware unit that inspired its design, the plug-in is noisy, unpredictable, and wonderfully lo-fi. How closely it actually replicates the sound of the Copicat is up for contention. 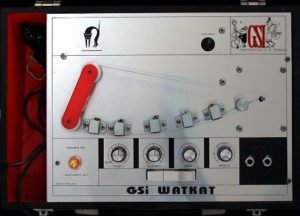 But one thing is for sure: the Watkat does add a lot of character to your tracks. Cockos’ ReaDelay is part of the ReaPlugs FX suite that will be familiar to users of the company’s celebrated Reaper DAW. ReaDelay is a multi-tap delay that can have individual delays of as long as 10 seconds, with practically no tap count limit. 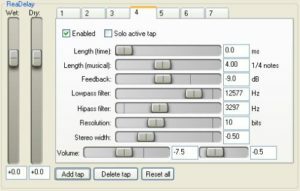 Tap lengths can be set to time values or quarter notes. The option to choose one or the other is always good to have in a delay, and it is an especially nice touch in a free plug-in. ++audio’s Rubbadub excels at thick and dirty dub delay, but it can handle various other task as well. The good range of modulation options make it capable of producing cool flanger effects, and there is even a variable filter for more creative options. Unfortunately, it is not available for download at this moment, and we don’t know when it will be. All these delays are actually pretty good, and you really can’t go wrong with any one of them. Some are better suited to certain applications than others of course, as in the case of Valhalla’s Freq Echo’s capability to product modulated delays. But they can all handle a broad range of delay tasks, from standard echoes and slapback to flanging and chorusing, to more outlandish effects. That being said, one plug-in stands out in particular: Voxengo’s Tempo Delay. 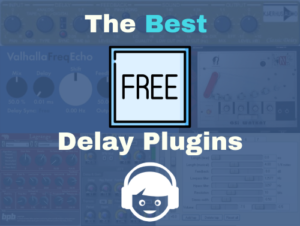 With its array of features, its modulation options, and great sound, this is one of the best free delay vst plugins that can stand up proudly against the best paid offerings on the market. Great list, very useful. It could be good if you could make some sort of comparation with commercial plugins… to help us understanding if it is worth to spend hundred dollars (since there are free alternatives). Thank you, Nicola. Generally the professional plugins are better than the freed ones. For one there’s going to be ongoing support. Free plugins normally don’t have that support. That doesn’t stop you from trying it out. 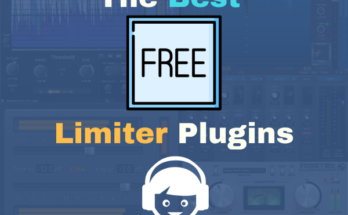 Free plugins are often a good intro into the world of 3rd party plugins. My suggestion is to just try whichever one tickles your fancy. If you like it’s capability but you want more from a free plugin, then take a look at its pro alternative. I cove a lot of them in this plugin guide, as well as under the software category.